I write this editorial on December 6th, 2018, having just received the email informing me that manuscript number 18-1114 is ready for assignment. With just over three weeks to the end of the year, it is possible that the journal will pass 1200 submissions for the first time in its history. This is a remarkable number, given that in 2006, the first year that Archives of Virology used the on-line Editorial Manager system, only 350 manuscripts were submitted. As Editor-in-Chief, it is my task to ensure that all manuscripts receive a fair and timely review, despite this almost four-fold increase in their number. Therefore, the more interesting parameters for authors and authors-to-be are perhaps the mean times required for acceptance or rejection of a manuscript submitted to Archives of Virology. In 2006, these were 98 and 54 days, respectively, compared with 120 and 26 for 2018. Both the rise in the mean time for acceptance and the halving of the time required for rejection reflect an increased stringency in judging whether a manuscript is even suitable for review for publication in Archives of Virology and whether a manuscript shows a correctly documented advance in knowledge to merit publication. I discussed the main reasons for rejection and suggested ways to increase the probability of acceptance in my editorial in August, 2018 . 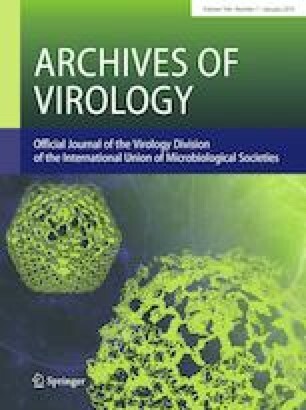 The mission of Archives of Virology to cover all aspects of virology is clearly reflected in the manuscripts submitted and published in 2018. A glance at the most cited and most downloaded papers from 2017 and 2018 illustrates the broad scope of the journal. Two of the most cited papers in 2018 examined inhibitors of Zika virus proteins whereas a further three papers concerned luteo- and fabaviruses infecting peach and cherry. Of the most downloaded papers, the singly most heavily downloaded one (over 3500 downloads) concerned the use of CRISPR/cas9 technology to abrogate pseudorabies virus replication. Other viruses in heavily downloaded papers came from the retrovirus, geminivirus, paramyxovirus and birnavirus families. Examining 1200 manuscripts in one year would not be possible without the support of the reviewers, editors and production team of the journal. In the period from January 2018 to August 2018 (the last month for which I have the data from Springer Nature), editors of Archives of Virology sent out 3243 invitations to review. 1470 reviewers (i.e. around 50%) accepted the invitation of whom 1335 completed the task (i.e. a completion rate of over 90%). The peer review system is continuously being brought into question. However, I think the above numbers show how members of the scientific community are willing to support this system in the quest to ensure that the quality of the scientific literature is maintained. I would like to take this opportunity to thank everyone who reviewed manuscripts for Archives in 2018 and hope that we will be able to rely on your services in the coming years. In the same vein, I would also like to thank all of the members of the editorial board of Archives of Virology for their support in ensuring fair and timely peer review for manuscripts submitted to the journal. Special thanks go to Hans-Dieter Klenk and Martin Schwemmle who are leaving the editorial board after serving for just under 25 years and just over 10 years, respectively. To replace these two esteemed scientists and to maintain the quality and timeliness of the journal despite the ever growing number of manuscripts, it was a pleasure to welcome in 2018 the following twelve virologists from all over the globe who accepted the invitation to join the editorial board: Graciela Andrei, Tatjana Avšič-Županc, Ana Bratanich, William Dundon, Elvira Fiallo-Olivé, Andrew Firth, Reimar Johne, Ioly Kotta-Loizou, Helene Sanfacon, Carolina Scagnolari, Scott Schmid and Johannes Wittmann. I look forward to working with you and thank you in advance for your support. Despite these additions, some virus families are still not covered, so I will be extending a few more invitations to join the Editorial Board in 2019. One of the distinctive characteristics that sets Archives of Virology apart from other journals is the language and taxonomy editing that is performed on each manuscript that is scientifically accepted. Steven Allison has been performing this task with verve and passion for the last 14 years and will hopefully continue to do so in the years to come. Steven was ably supported for two years from September 2016 to August 2018 by Dalan Bailey – Dalan, many thanks. Steven will be supported in the coming months by Marc van Regenmortel, the former editor-in-chief of Archives of Virology. 2018 marked the retirement of Marc van Regenmortel following his 20 year appointment as Editor-in-Chief. The end of Marc’s tenure was celebrated with a scientific symposium in June 2018; you can read papers on the talks presented in the August 2018 volume of Archives of Virology. 2019 is also a special year for the journal as it celebrates the 80th anniversary of the publication of the first issue in 1939 under the name “Archiv für die gesamte Virusforschung”. This anniversary will also be marked with a scientific symposium to be held in Vienna in November 2019. Further details on the symposium will be available on-line this month and in an editorial in February 2019.